Thesis Title: Loss Analysis of the Feeders Using Forward Sweeping Method in Kerala Electricity Board, Trivandrum, Kerala. Modeling of Permanent Magnet (PM) Synchronous Machine:1 kW, 400 V, 4600 rpm. Modeling of Synchronous Machine: 2 MVA, 400 V, 50 Hz,1500 rpm. Vector Control of PM Synchronous Generator & Motor. Vector Control of Grid Side Inverter. Maximum Power point Tracking of Wind Energy Conversion System. Implementation: Three phase Sine PWM control of Induction Motor using the DSP Processor TMS320F2812. Implementation: Vector control of PM Synchronous Motor using the DSP Processor TMS320F2812. Prof. Dr. Krishna Vasudevan, IITM Chennai. Prof. Dr. Srirama Srinivas, IITM Chennai. Prof. Dr. Mahesh Kumar, IITM Chennai. Rtd. Prof. Dr. P.A. Janakiraman, IITM Chennai. From April 2016 – Principal, MEA Engineering College, Perinthalmanna, Malappuram District, Kerala, India. 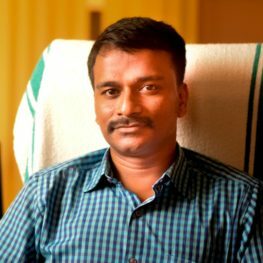 January 2015 – March 2016 – Associate Professor and Head, Department of EEE, MEA Engineering College, Perinthalmanna, Malappuram District, Kerala. January 2010 – December 2014 – Half Time Teaching & Research Assistant (HTRA), IIITD&M Kancheepuram, Chennai. July 2005 – December 2009 – Lecturer, Department of EEE, St. Xavier’s Catholic College of Engineering, Chunkankadai, Nagarcoil, Tamilnadu. Invited Talk – Anna University Sponsored FDP titled “Solid State Drives” Organized by the Department of EEE, St.Xaviers Catholic College of Engineering, Nagercoil. Faculty Advisor (During 2008) – Society of Electrical Engineers, Department of EEE, St.Xaviers Catholic College of Engineering, Nagercoil. Power Engineers Training and Research Centre (PETARC), Under Kerala State Electricity Board Organized 3 days Training Program on “Power Industry Familiarization” between 15/10/2015 and 17/10/2015. The Indo-German Center for Sustainability (IGCS), IITM Chennai Organized workshop on “Improving Sustainability in Energy – Conventional and Renewable” between 04/12/2014 and 05/12/2014. Council of Scientific and Industrial Research (CSIR) , New Delhi Sponsored and School of Electrical Engineering, VIT – Chennai Organized One day National Level workshop on “Role of Power Electronics in Grid Integration of Renewable Energy Sources – Issues and Challenges,” 16/03/2013. National Mission On Power Electronics Technology (NAMPET) and National Institute of Technology Trichy (NITT) Sponsored Workshop, “National Workshop on Power Electronics,” Nov. 2008. IEEE Sponsored Workshop, “Workshop on Embedded Systems,” Sep. 2008. Continuing Education, Indian Institute of Science (IISc) Bangalore Sponsored Faculty Development Programme (FDP), “Simulation of Power Electronics Circuits and Systems,” Aug. 2006. AICTE Sponsored FDP, “Soft Computing Technique in Power Converter Design,” June 2006. Shahana and Rajin M. Linus, “Modified Maximum Power Point Tracking for PV System Using Single Switch DC/DC Converter,” International Conference on Electrical, Electronics, and Optimization Techniques (ICEEOT 2016), 3rd ? 5th March 2016, DMI College, Chennai. Rajin M. Linus, and Damodharan P., “Maximum Power Point Tracking of PMSG Based Grid Connected WECS using Quadrature Axis Current,” 4th International Conference on Renewable Energy Research and Application (ICRERA 2015), 22nd ? 25th November 2015, Palermo, Italy. Rajin M. Linus, and Damodharan P., “Performance Analysis of Field Oriented Controlled Grid Side Inverter For Grid Synchronization of Wind Energy Conversion System Under Di_erent Loaded Conditions.,” IEEE Region 10 Humanitarian Technology Conference 2014 (IEEE R10 HTC) -Engineering a Sustainable future for humanity, 6th ? 9th August 2014, Hilton Hotel, Chennai. Rajin M. Linus, and Damodharan P., “Performance of Buck / PWM Converter in Permanent Magnet Synchronous Generator Based Wind Energy Conversion System,” 2014 IET International Conference on Energy E_cient Technologies For Sustainability (ICEETS’14), 7th ? 9th April 2014, SXCCE, Nagercoil. Rajin M. Linus, “Solid State Drives” , Publisher: M.R. Bharathi, Charulatha Publications, Editor: Charulatha Publications, ISBN: A100009235, Edition: 2007. Documentation- Latex, DIA, MS Word.